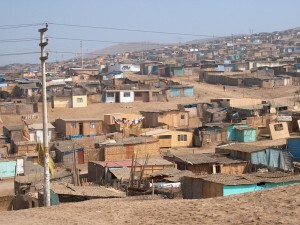 NEWS: Latin-American land-for-housing projects, compared to two urban developments in Africa. See also a new book: To Build a city in Africa. By Rachel Keeton and Michelle Provoost. This website centers mainly on housing and planning for the benefit of lower-income households. Land-for-housing projects are being developed mostly as urban expansion plans, small-scale or large-scale, developed for and with lower-income and middle-income groups. Generally, two housing provisions systems can be found; 1) self-help individual or mutual housing provision, and 2) housing provision in social or public housing schemes, where private parties play an increasing role. The results on housing production depend on various aspects as urban pressure, rural-urban migration, economic growth, land availability, income situations of the various income groups, housing subsidies and public support that low-income groups can obtain from their governments. There are indications that self-help housing by low-income groups is declining and that middle-income groups are arriving increasingly on the housing market where private corporations act as developer of land-and-home packages. In Central America, a large urban expansion project is to be found in León, Nicaragua. The León Southeast (LSE) scheme was started as a land-for-housing program which gradually became an integral urban expansion project for at least 6,000 homes, leading – inclusive surrounding old neighborhoods – towards a city part with around 50,000 residents. At the start of the project in 1998, it was expected that self-construction of homes by individual households would play a key role, as was done in the surrounding areas. Although self-constructed housing occurred during the years, it did not lead towards mass housing production by low-income households in LSE. Government assistance for housing fluctuated through the years. In the period 2011–2018, housing projects were started by private developers, participating in the social housing production for middle-income households. A total of 4,000 houses were built in Southeast: 3,000 homes by developers and NGOs for middle-income households, and around 1,000 by individual families. 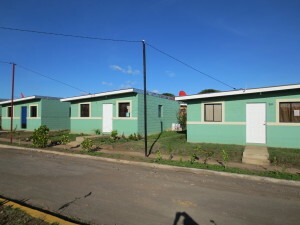 Housing packages – plot and home – were sold to lower middle-income households for US$15,000 – US$25,000. Meanwhile, unplanned growth at the fringes of the city of León went on and on, which hindered the planned growth of the Southeast project. Another land-for-housing project to be mentioned is the Solanda scheme in Quito, Ecuador, which was developed as an alternative to the growth of informal settlements. 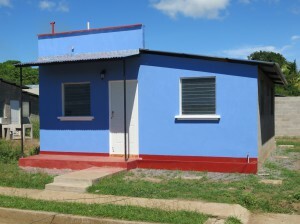 The project, based on affordability, resulted in an array of incremental housing solutions; each required a family to upgrade and expand through self-help techniques. The text hereafter is taken from earl Kessler (2014 publication). In the 1980s, the NGO Foundation Mariana de Jesus, the owner of a large flat site in the south of Quito, decided to develop a low-income housing project called Solanda, which offered an alternative to the squatter settlements on the slopes of the Andes. The project was a unique combination of local government urban services delivery, national government project sponsorship and financing, and the NGO’s contribution of land, outreach, and beneficiary selection. Solanda built more than 6,200 housing units and the population has grown to more than 80,000. Solanda’s vertical expansion has been developed from a mostly single-story start to the multi-story community. A lesson is that incremental housing requires structural specifications designed for consolidation and expansion, especially the foundations to support the densification of settlements. No new project like Solanda has been initiated by its original government and private sector sponsors, or by anybody else; unfortunately the Solanda concept was only carried out once. (RTI Institute 2005). Tatu City is a 2,000-hectare live-work-play urban development, located 24 km outside central Nairobi with the potential to house more than 200,000 residents. It is a newly designed satellite city in the urban growth trajectory of rapidly expanding Nairobi. The infrastructure deployed includes water, sewerage, electricity and roads. It is a large-scale private development project, and first residential areas are developed now. Kenyan, East African and multinational companies are relocating to Tatu Industrial Park to build manufacturing facilities in the expansion plans and it is to be expected that this will provide many jobs. Tatu City is called a flagship private sector project and part of Kenya’s Vision 2030. The satellite city is being developed by Rendeavour, who offers plots for higher income groups, with an selection of house designs to choose from, varying from 3, 4 and 5 bedroom villas and bungalows in American style. Also a mix of townhouses and condominiums will be added in its first phase. Karibu Homes, a developer of modern, inclusive communities in Kenya, has signed an agreement with Tatu City to enable it to develop over 1,000 affordable homes at the mixed-use and mixed-income development. Apartments will cost US$35,000 for two bedroom dwellings, and more. Kilamba New City (Nova Cidade de Kilamba) was built as an overflow of the crowded capital city Luanda of Angola. Kilamba is located approximately 30 km south of Luanda. It is a pilot project for a new mode of urbanization, namely the development of 6 new towns (also called ‘centralities’). It was designed to be a development consisting of affordable housing for 500,000 Angolans; a first phase is realized with houses for 100,000 inhabitants. Although it was a government initiative, the new city was designed and built by the China International trust and investment Corporation. The Angola government paid with oil deliveries to China. The result is an urban area with 720 flats of 5 to 13 floors. Initially, Kilamba housing had very much vacancy and journalists reported that the area was a ‘ghost town’. The prices were too high for most Angolans really. In 2013, the government managed to lower the purchase price (or rent-purchase arrangement) of homes with 50 percent and arranged additional finance in the form of mortgages that previously were not available. 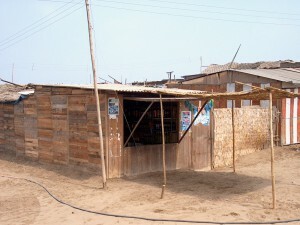 When the smallest housing units dropped in price from US$125,000 to US$70,000, Kilamba suddenly became Luanda’s most accessible property market, and the homes were sold soon (Chloé Buire, 2015, Africa Research Institute). Within this expansion concept no money is set aside for the maintenance of the area, which quickly can lead to urban decay (Keeton and Provoost, 2019). Ultimately, the project turned out to be a middle-income district, where low-income groups are hardly sheltered. A recent extension is planned in phase II for around 30,000 inhabitants with more affordable housing. Informal settlements are growing up at the eastern border of the area. 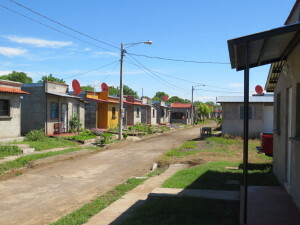 In Latin America, incremental house construction was common practice; without interference from the local authorities only informal districts with informal housing were built. This could be prevented by land-for-housing schemes developed by local governments or private parties under surveillance of a municipality. This can stimulate the building of social housing projects, while self-help housing practices can be integrated. It has happened in the example of León Southeast, where urban dynamic is rather low. As a result, many sold plots were not built up for years by the families who had bought the plots, leading towards very ineffective urban land-use. Advantage of the project is that developers built many low-cost housing packages (from US$15,000 – US$25,000) to lower-middle income households, which was made possible by the relatively low land-prices, state subsidies and soft loans (mortgages). 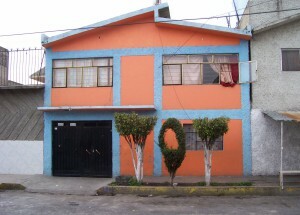 Incremental house construction can also go relatively quickly, as has happened in Solanda, Quito. This rapid development is explained from the large population pressure in Quito and the high urban dynamic. The Solanda experience says that incremental housing requires structural specifications designed for vertical expansions, housing with adequate foundations and housing structures making possible urban densification of settlements. Urban planning, good cooperation between the local governments and private and institutional actors has proven to be effective here. 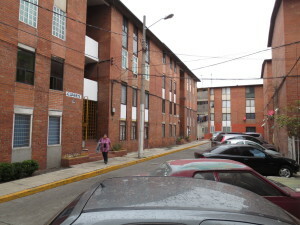 Another example of an early high-density pilot project is Ciudad Bachué in Bogotá, Colombia; here all housing types were intended to be expanded progressively. Households of single-family and multi-family dwellings could develop their homes within built structures, which gave them the possibility to finish and refurbish their homes at their own paces. 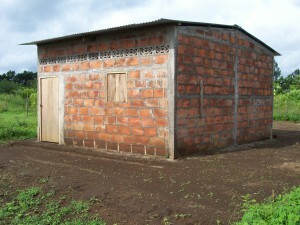 Incremental house building is also common in Africa. It leads widely to many land development schemes, step-by-step urban growths, slow fill-ups of private plots, and to remote sub-urban areas. This is not a good development – seen the necessary planned growth of African cities. Logical alternatives are: planned compact cities, centrally located and well connected, where housing production is well organized. Of course, this will go together with stacked homes, and often high-rise buildings. The development of Kilamba New City has led to a high housing production, with high-rise apartment buildings, but there is hardly a connection to the income situation of the majority of the population. Therefore, this vast urban district remained inhabited during its first years. Later, government interventions have made possible that the houses were sold to citizens from the middle income groups, but low income groups were barely served. The development of Tatu City near Nairobi is hopeful because it seeks to build houses for various income groups. The master plan is based on inclusive development in which also business parks and other commercial functions will be included. The business model of this private land development is based on the development of housing types for the higher-and middle-income groups. Housing plans are also prepared for lower income groups, but US $35,000 for a two bedroom dwelling is still too high for households with really low incomes. The solution might be here that this future residential area also shall contain sub-areas where low-income groups can be housed also in higher densities. This requires public influence on this private urban development plan. Public-private cooperation is essential, and that should be arranged at the start of the project and not during or at the end of it. In principle, a part of the profit of the expensive plots and houses should be used to co-finance housing solutions for low-income households. Land for housing schemes are important instruments to serve the needs of households with low incomes in addressing their housing needs. In the past, urban land development projects to facilitate self-help incremental housing were mostly called sites-and-services schemes. The idea was to create land and to develop it in order to help the households seeking for a place to live in a city, in order to let them build their houses on own plots. Such schemes or policies were introduced in a series of developing countries since the 1950s and 1960s. Land for housing policies can serve the middle-income as well as the lower-income households. The first sites-and-services projects offered only available land for individual self-help housing and the most necessary services, especially concerning the provision of drinking water and electricity. The goal was to prevent that poor households would invade illegally urban and suburban spaces, private and public ones. Such invasions happened very often and created informal houses and neighborhoods and it was often was very difficult for the local government to manage this phenomenon. Political and social conflicts were often the case, and of course, the land-ownership was disputed. Sometimes, dangerous situations were created when families settled down in areas where one should not build or develop at all. Some areas are too dangerous to settle in, such as areas where one could expect flooding from rivers, earthquakes and the consequences of volcano eruptions. Those situations are present in many countries and cities. The local governments should designate in their urban planning schemes the zones where such dangers are present and prevent and forbid that occupation occurs. But such policies are often not operational, or difficult to realize. Illegal occupation can be fought through proactive housing policies to serve the low-income groups by land-for-housing programs. However, this might lead towards land speculation that can hinder the execution of social housing policies. Local governments should always take the right measures, in order to prevent social and political conflicts, and that new dangerous housing and living circumstances emerge. The goal of this website is to address, find and present a series of interesting land-for-housing schemes and programs that facilitate successfully the ongoing self-help incremental housing. In land-for-housing issues, urban planning always must play a role in the provision or regulation of land for self-help incremental housing. That role can be pro-acting, supporting, improving, or correcting. Normally, it is done by local governments with the necessary financial, legal and organizational help of the central government. In other cases, financial and organizational help – or part of it – was delivered by (inter)national aid organizations. The acquisition of land for housing is a crucial issue concerning land for social programs. Most favorably, the local government is the main actor in creating land for housing schemes. But public-private cooperation must sometimes be considered. Creating finance for social housing is often being done by special funds, or ‘fideicomisos’ in Spanish. In the 1950s and 1960’s there were good opportunities for municipal land programs because at that times it was not very difficult to purchase land for housing in the vicinity of the city centers. However, worldwide this situation has been changed dramatically, as consequence of the huge expansions of the cities and the rise of the land prices. Acquisition of land for housing by local governments is mostly not affordable, and therefore, help from the national governments or the international community is needed. One necessary feature of a land for housing scheme is that the land exploitation is ‘closed’, which means that the costs of purchase and development of the sites must be recovered by the prices of the plots (which must be paid by the households). But this means that the ultimate prices of the plots are often too high for families with (very) low incomes. This is why the help of the governments in infrastructure provision and finance of land programs are necessary in order to be able to support the self-help incremental housing. This is also why the support for self-help incremental housing must be part of social housing policies. The demand for land for housing is huge and the offer of suitable land is mostly not sufficient. 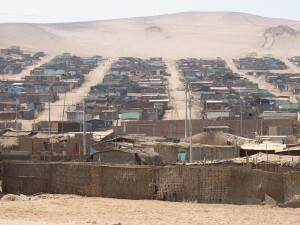 For example, one can find in Peru a situation of many public land programs for housing (see the descriptions of the housing situation in four municipalities). 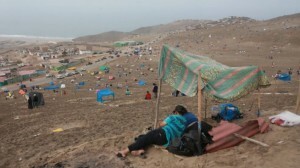 The city governments of Peru are facing regularly large groups of migrants who try to occupy illegally land on the outskirts of the cities, and herewith try to obtain the cooperation of the City in order to be able to settle themselves there as self-builders. However, regulating and formalizing of illegal land occupations cannot always be allowed. Urban planning regulations can be restrictive and so can be the land-ownership. The answer of the city governments was the definition of urban suburbs zones for ‘human settlements’, in Spanish ‘Asentamientos Humanos‘, being land for incremental self-help housing. Despite the large range of “human settlements”, informal land occupations by large groups of people are still occurring. City governments are repeatedly forced to deal with the question: tolerate or offering alternatives. In all cases, urban land and housing policies are necessary. Municipality of Villa el Salvador, Lima, Peru. 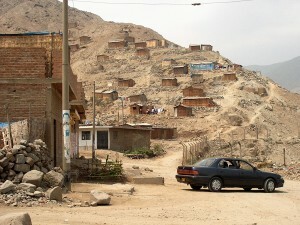 Urban community of Huaycán, municipality of Ate, Peru. Pilot project New Pachacútec, Ventanilla, Peru. 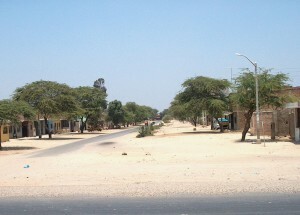 Piura West, municipality of Piura, Peru. Land for housing project León South East, León, Nicaragua. Municipality of Nezahualcóyotl, México City, México. 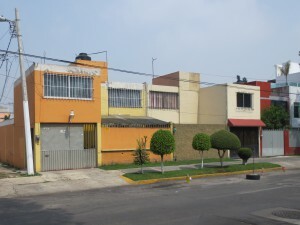 Housing typologies in the Municipality of Tlalnepantla de Baz, Mexico City: self-managed housing and various social housing types. 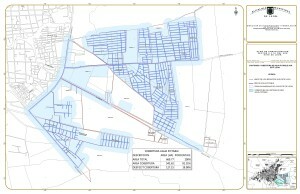 Land development for housing in Egypt and Sadat City. 1 Municipality of Villa el Salvador, Lima, Peru. The city of Villa El Salvador which was founded in 1973, is located South of Lima. The city was built in the middle of a desert and formed part of a planning process led by the national government and was aimed at meeting the demand of that time for self-built houses. First of all, main access roads were made, and plots were handed over to families after the area was divided – building block by building block – into parcels (plots). Initially, there were only some basic services. For example, during the first years of development, drinking water was supplied by tank lorries. After a heavy earthquake, which destroyed the city of Huaraz in Ancash, 10,000 people migrated to the capital in 1971. They formed the basis for the settlement of the new urban core that had been located outside the capital’s urban area of that time, into the southern direction. This was the start for Villa el Salvador (also called ‘VES’), now a municipality within metropolitan Lima. In 2016 – VES has a population of 454,000. 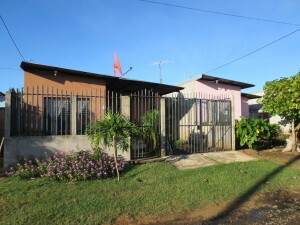 Villa el Salvador is considered a large test case in the self-building of houses and setting up of micro businesses with the participation of the local authority and private organizations. Many individual houses have a shop or workspace. The programs for spatial planning were carried out by the local authority while the Ngo DESCO assisted many families in building the houses properly. DESCO also provided loans for families that asked for finance and technical assistance, but not every household made use of that possibility. Later, the government developed programs for finance of home improvements, and families can make use of that depending on their income situation. The self-building of the houses and the houses with a workplace was being done step by step by individual families, which is also called incremental housing. Many families succeeded and others didn’t, or came halfway, which can be seen in almost every street image. It was and still is fully up to the residents how and when they complete their houses. 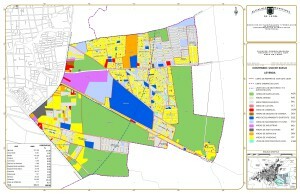 The land management in Villa el Salvador shows a typically urban layout. Every residential area consists of 16 manzanas, while every manzana (which is a building block) has 24 plots of 90 square meters each. Every residential area (also called super-manzana) has its own central area which includes a park for children, a recreational area, a school, and a community center. In 2016, Villa el Salvador can be seen as a consolidated urban area with lower- and middle-income households. The development model is a mixture of planning and guidance by the national and the local governments on the one hand, and self-help or self-managed incremental housing on the other. 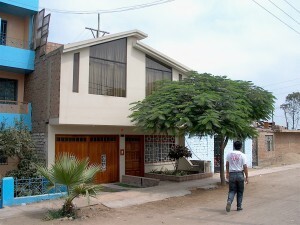 This development model is applicated in many other cities in Peru. Street images in Villa el Salvador. The urban community of Huaycán, officially ‘Comunidad Urbana Autogestionaria de Huaycán’, is a new town located in the district (municipality) of Ate, about 20 km. east of Lima. Huaycán is a suburb of Lima really, where thousands of in-migrants from different parts of Peru could settle, in order to search job opportunities in Lima. Huaycán was founded in the 1980s and in 2004, had a population of over 120,000. In 1985, the municipality of Lima took over the management of the planning of the urban development process. From the beginning, a new local authority gradually started to control the urban management, and a little later, began to delegate the responsibilities to the population organizations. 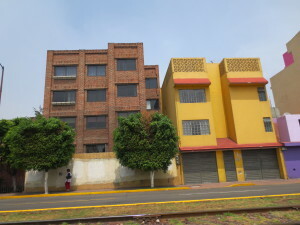 Together with the population, the municipal council developed the so-called UCV (housing units in the neighborhood), which consist of a block of houses on approximately 1 ha. of land. 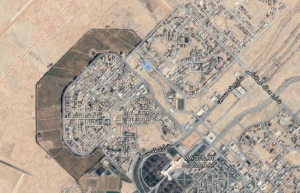 Each block consists of 60 plots of 90 m2. The UVC’s were set up as housing units with business purposes which were situated in the main streets. As time went by the Housing program of Huaycán was brought under the responsibility of the municipal council of Ate. 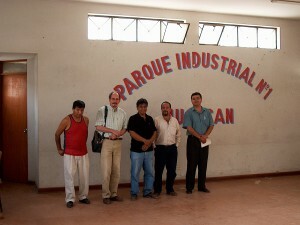 In Huaycán, the UCV’s have their own internal communal space. The main entrance to the houses is on the inside and the entrances open onto a space of 4,600 m2, which is intended for education, health care, and recreation. This idea is closely related to an existing neighborhood organization model that was realized in other urban areas. From the beginning of the land occupation, the people lived in temporary huts of rush mats and carton. Gradually, they began to build houses using proper building materials. There are still houses of only one floor and with rush mats/carton, which certainly stand out among the completed four-storey buildings. In contrast to other settlements, Huaycán was developed in an orderly and systematic manner. 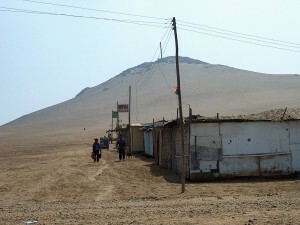 Since around 2000, there are temporary houses of residents on the mountainsides surrounding Huaycán. There, households settled informally, because eventually for many families other options were not there. This created a legal problem between the central management and COFOPRI; the latter governmental organization had given the people titles to ownership despite the fact that there are local arrangements to protect the mountainsides. Several proposals for relocating the families elsewhere in the neighborhood came up, but there is a lack of suitable space for housing. 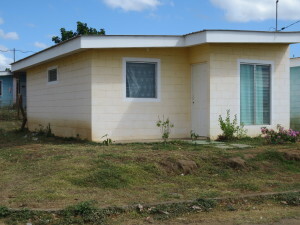 The families are fully responsible for the completion and the improvements of the homes In the 1980s and 1990s the Building Materials Bank (‘BANMAT’) granted loans for the self-building of houses to many families in Huaycán. One plot is 90 m2 and 60 plots make up a UCV. In the period 1985 – 2000 around 25,000 plots were made. The national government has set aside an area in Huaycán for production activities, and a production center was built in business park No. 1 (in Huaycán there are 3 of such parks). The business park consists of 94 plots of 140 m2 each, intended for making clothes, carpenters’ workshops, shoe production, crafts, light metal industry and food production. On the urban level, there is a municipal spatial plan for the layout of the zone. The development model is a mixture of planning and guidance by the local governments on the one hand, and self-help or self-managed incremental housing on the other. But the illegal occupation of the slopes of the mountains is still hard to manage. Various images of Huaycán, municipality of Ate, east of Lima, Peru. Lower row: urban development plan. Illegal occupation of land at the slopes of mountains; and a visit to the Industrial Park. The New (Nuevo) Pachacútec Pilot Project (PPNP) was established in 2001 and is the result of a political solution that became necessary because of the huge and ongoing demand for land for housing from thousands of families. 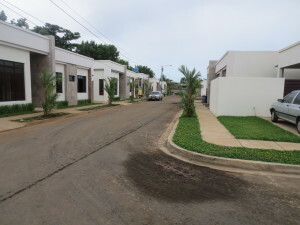 The new town Pachacútec is situated northwest of Ventanilla and was founded in 1985. 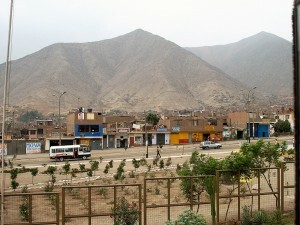 Earlier, in the 1960s, Ventanilla was founded as a satellite town of Lima, some 30-40 km from the capital. In those days the so-called ruling council took the initiative to build core residential areas with basic amenities and minimal infrastructure and services for families that did not have a home. Initially, the services were really basic, for example drinking water was delivered by water trucks. Later, drinking water systems were installed with storage tanks on the hills, and networks of pipes and water taps in the streets. In Nuevo Pachacútec, there have been two cases of major land development, being sites-and-services. After the first land development and its occupation, one spoke of land being designated to housing associations of lower ranks of the army and the police, and to the population organizations of the homeless who set up housing associations. The second resulted in the relocation of thousands of families who had illegally occupied agricultural land in the area of Villa el Salvador. In 2000, the government started the Programme for Family Plots (PROFAM), and that resulted in the Pilot Project PPNP. The area is situated in the urban expansion area of the Ventanilla district (municipality), within the development axis of metropolitan into the North. In the beginning, there was no drinking water and no sewage system in this pilot project and this resulted in serious environmental problems. The access roads were not paved and drinking water was and still is supplied by tank lorries. The supply of electricity was provisional, and there was huge unemployment and serious poverty. These constraints are partly due to the problems of starting up the urban development process. Initially, a technical committee, part of the Ministry of Housing, has prepared the urban development plan and the land division for the PPNP. The initial vision concerning the satellite city of Ventanilla was: being economic independent from Lima. This meant that not only homes should be developed, but also employment for the residents of this new urban areas. However, it took many years before the economic development took place sufficiently. 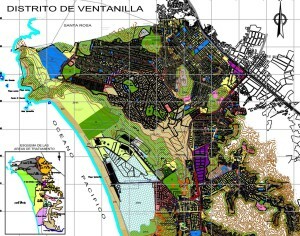 Nowadays, the municipality of Ventanilla is planning and developing successfully economic growth zones. For years, Ventanilla was also known as a dormitory town, where many residents were looking for a job in the central city, or otherwise outside the town. 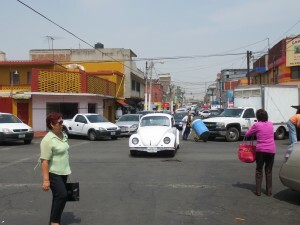 Initially, the municipality of Ventanilla was not involved in the Nuevo Pachacútec urban development project, but that has changed since 2004. In 2016, a huge illegal invasion is occurring again on the hills and slopes in the vicinity of the area. Various images from the period 2004 – 2010. 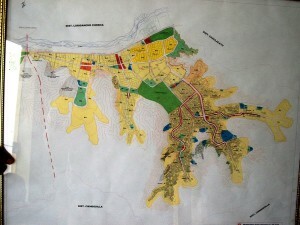 Inclusive the development plan of New Pachacútec, Ventanilla. In the beginning, the water supply and the sewerage solutions were very modest (right-below: latrine in a yard of a house). Informal occupation of the slopes of hills around Pachacútec by hundreds of families. [El Comercio February 2016]. 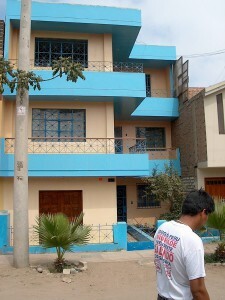 4 Piura West, Municipality of Piura, Peru. 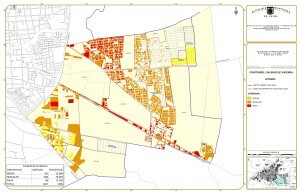 In Piura West, sector South, one can find spontaneous land developments, which came up as invasions really, and eventually, the urban land development took place in cooperation with the national and local governments. All modest dwellings were and still are being built through individual self-help incremental housing activities. Initially, the households built their huts with rush mats, and wood (etc.). Later, they build the wall of bricks. In the long term, a consolidated area will be reachable, but it is expected that this will take many years. 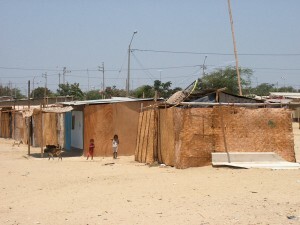 At the fringes of this vast housing area of Piura South West, one can find invasions of groups of poor families. They normally come in large groups and settle illegally. 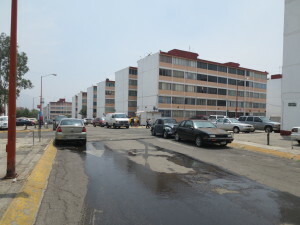 This is really a Peruvian custom; as in other cities (think of Lima and its surroundings), the development model is a mixture of planning and guidance by the local governments on the one hand, and self-help or self-managed incremental housing on the other. 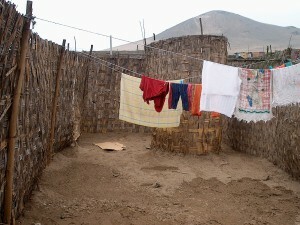 Difficulties come up when the local government tolerates in practice the illegal invasions, especially in areas where housing is not wanted; in the case of Piura South West, there is a possibility of flooding during the rainy season. 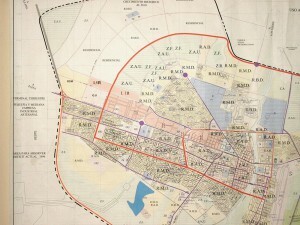 The municipal director plan of 2010 indicated a red line that cannot be crossed, because of the inundation zone. At the southern part of the city, the municipality is planning an area for new human settlements, for 6,000 plots for self-help housing, but the land must be acquired from private owners. 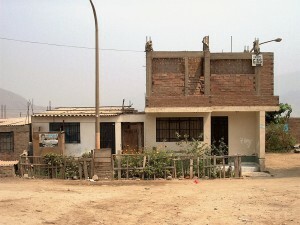 Images that were taken in 2006 in the western part of the municipality of Piura, Peru, where many ‘Asentamientos Humanos’, or human settlements were created and most of them were tolerated, and through city planning incorporated in the urban sphere. 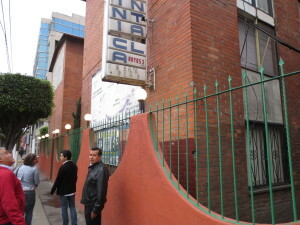 In the first row: new neighborhood opposite the new market Las Capullanas, at the Panamericana Nte. 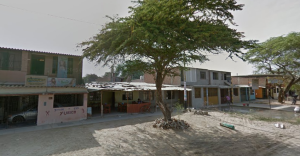 Photos by Google maps in the same street as in te first row (Las Capullanas near the market), around 10 years later, showing the development capacity of the families involved in self-help urbanization. 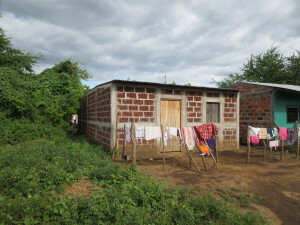 5 Land for housing program León South East, Nicaragua. 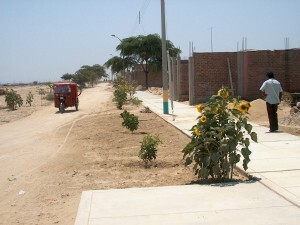 The municipal land-for-housing program León South East (LSE), provides plots for the construction of houses for and by households with low-incomes. Mentioned households could – and still can – purchase a plot mostly through a loan from the project funds, and make use of a pay-off arrangement. When the plot is completely paid or paid-off, the household obtains the legal property title. 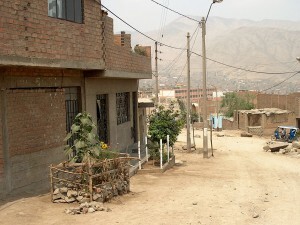 As self-help housing activities in León were normally undertaken by poor households or individuals, this way of development was initially chosen for the LSE area. The households often started to build simple accommodations with cheap materials like wood, plastic and zinc sheets in the backyard of their acquired plots. This first dwelling was mostly a temporary shelter, while the house was being built step by step at the front of the street. In León, the houses must be built earthquake resistant; technical assistance should be available, but that was not always the case. Although self-help incremental housing was the norm in León during decades, the number of self-built houses lowered gradually after 2005, and a certain percentage of the plots remained unbuilt and unoccupied. Since 1999, the LSE land program has developed 6,000 plots for self-help housing, and for organized subsidized housing projects. Between 2000 and 2005, hundreds of individual plots were developed, often with the help of housing NGOs. 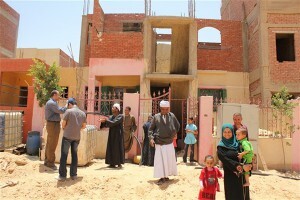 The goal was to benefit the low-income and middle-income households, and plots with modest houses were sold to families. In that period, the prices of the plots were relatively low: between US$450 and US$1500. Their area varies between 150-160 m2, and 200-250 m2. This way of land developing – a sites-and-services scheme really – became possible through technical and financial help from the bond the local government has with the city of Utrecht. The location was in León South East, and several new repartos (small neighborhoods) were created there: ‘Azarias H. Pallaís’; ‘Antenor Sandino’; ‘Mariana Sansón’, and after 2008 ‘Utrecht’. Other neighborhoods that were developed through the program are: ‘Santiago de los Caballeros’ with large plots for higher income households, and outside the territory of LSE: the neighborhood ‘La Merced’ for middle-income households. Between 2005 and 2008, a stagnation of the self-help housing emerged due to the fact that in the initial years the services and infrastructures were very modest. Sometimes, water provision was not even arranged. Some buyers of plots did not want to build a house there because (they said) it was too far from the city center, or it was too unsafe there. After 2008, the municipal housing policy changed drastically, when some private developers emerged and purchased large numbers of plots for the development of housing projects of single family homes. Buyers could acquire a plot with a modest house, from a project developer, with a subsidy and finance arrangement, which facilitated by the central government. 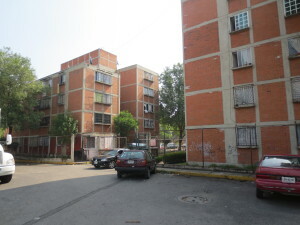 This gave access to this area in León to middle-income earners with a job (for example through the Union of teachers and the Union of taxi-drivers). The latter development was made possible through the creation of collective services such as drinking water supply, electricity supply, and sewerage, ultimately in a large part of León South East. 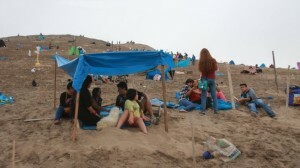 In the meantime, public services such as elementary schools, public health facilities, playgrounds, small parks, etc. were developed. Meanwhile, bus lines and cycle tracks give access to the city center and the industrial areas. Herewith, the attractiveness of the whole area has been upgraded significantly. The actual interventions in LSE by private property developers and worker’s Unions made that the project can be considered as a rather complete ‘sites-and-services’ scheme. The current arrangement (2016) is more expensive for the new buyers, but also makes the LSE area more attractive to settle. However, the initial goals to serve the very low-income households are not completely fulfilled. Consequently, there is still a shortage of low-cost housing for low-income earners and in 2013 invasions happened in green spaces in the area. The municipality had to find an alternative location for those settlers elsewhere. Many families formed in total ten housing cooperatives and these mutually purchased plots for a building process of houses. Here, self-help housing is also the case, but under technical guidance. In 2016, only two cooperatives were realized, and one was under construction, while seven others cooperatives are still searching for housing finance. Obtaining government finance for cooperatives seems to be difficult in Nicaragua, and in 2016 they are searching for private donations and loans. In 2015, the local government started a neighborhood renewal project for the first parts of the scheme that were developed between 2000 and 2005. First row: self-help or self-managed housing. Second row: houses built by project developers and (right) the building materials facility. Third row: housing solutions offered by associaltions and developers (2018). Consolidation research maps in 2014: land use (left), water supply (middle), housing quality. Since the 1950’s, the expansion of metropolitan Mexico City was realized into all directions, but encountered its specific limitations: the hills at the west, a preservation zone at the south, and the Texcoco Lake at the east. The latter shallow lake was reclaimed in the course of the 20th century, offering a flat area, which was firstly not perceived suitable for human settlement. 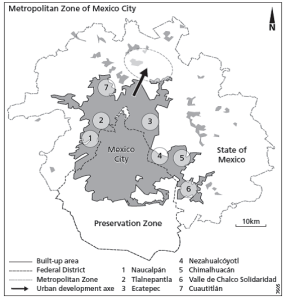 The areas north of central Mexico-City were the most appropriate for all kind of urban development; the current development axis is to be found there (see Figure 1). Many poor settlers were interested in the area east of central Mexico City, where urban development was initiated by private land developers, land merchants, and groups of poor households. Here, Nezahualcóyotl became the first urban nucleus east of the central City, while Chimalhuacán and Valle de Chalco Solidaridad, followed later. 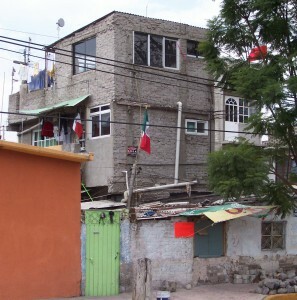 The new urban areas east of Mexico City were developed as irregular settlements, mainly through self-help housing, with Nezahualcóyotl as a prime example. Invading families from the central city and migrants from other regions came to Nezahualcóyotl – shortly ‘Neza’ – since the late 1950s. In 1954 approximately 40,000 people lived in the area ‘Neza’. During the 1970s and 1980s the area grew rapidly; eventually, the number of inhabitants stabilized after 2000 at around 1.1 million. In 1983, Neza was described as the greatest low-income urban area near Mexico City; at that time there were many constraints relating to urban services and infrastructure and the area was really a huge shanty town with the worst thinkable living conditions. But this situation changed, since Neza became gradually incorporated in the expanding metropolitan area of Mexico City, and since local government committed itself through investments in infrastructure which allowed massive land development. In the meantime, living and housing conditions in Neza’s self-help housing areas improved, backed by municipal planning, regularization, and municipal service deliveries. 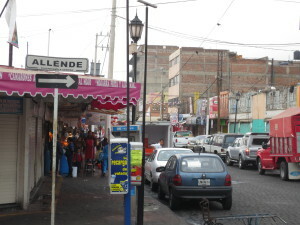 Neza obtained the municipal status in 1963 and is now a highly urbanized sub-center in the eastern part of the metropolis, around 9 km east of the City’s center. The municipality has a territory of 63.44 square kilometers. Population density is 19,324 inhabitants per square kilometer, equivalent to 43 dwellings per hectare. 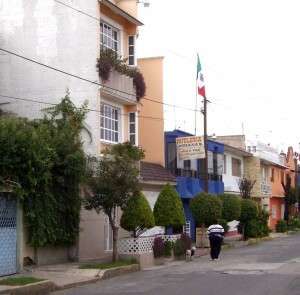 Total Neza consists of 85 neighborhoods. 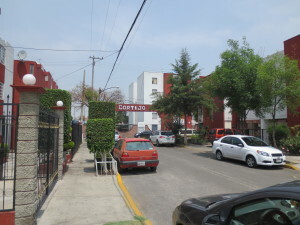 The work-force of the municipality is to a large extend oriented to Mexico City, but ‘Neza’ is not a dormitory area alone. Urban services such as a hospital, cathedral, sports- and cultural facilities, a university, etc. are spread out over the urban area. In 1983 around 90 per cent of the houses consisted of 1 layer; however, in 2010 this is clearly 2 layers (some houses have only one layer, the majority has two layers and some houses have 3 or 4 layers). Most plots measure 150 square meters. The number of houses in is 239 thousand and the average number of residents per dwelling was 5.2 in 1990. Housing typology is dominated by progressive single-family homes, mainly products of self-help housing. Of all dwellings around 75 per cent is a one-family house. 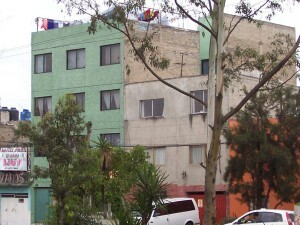 Other housing types are to be found in apartment complexes and collective housing; here one can find also rental homes. Many family houses have mixed use: housing and workplace or shop. Nezahualcóyotl may be considered a good example of the ‘power of self-help housing’, whereby massive consolidation processes gradually led to large-scale densification and improvement of dwelling-environments. 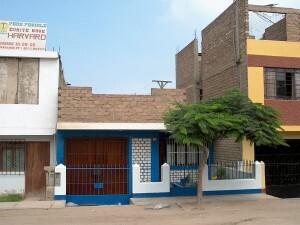 Figure 2, depicts the impressive changes in the dwelling environment of one of Neza’s manzanas (building blocks) that started as a self-help housing areas. 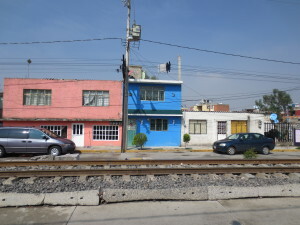 Still, the impressive transformation of Neza’s built environment is not necessarily typical of the development processes of other (former) squatter settlements in Metro Mexico City. Figure 1. Metropolitan Zone corresponding to Aguilar and Ward (2003). Figure 2. Information corresponding to Ribbeck (2002)  ‘Building Density and Height’, page 301. The huge densification as presented in the second scheme 1997 is not representative for all building blocks in Nezahualcóyotl as a whole, but it expresses the densification and concentration of investments in some parts of the City. The latter is not always self-help housing, but stronger private partners are investing (in businesses and or apartment buildings). 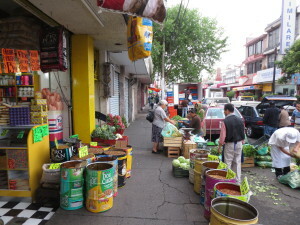 Photos were taken in various standard streets in Nezahualcóyotl. 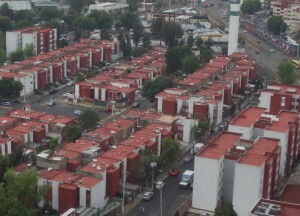 7 Housing typologies in the Municipality of Tlalnepantla de Baz, Mexico City: self-managed housing with a variety of social housing solutions. Two housing delivery mechanisms are providing housing for low-income groups in Mexico: self-help or self-managed housing and social housing. Although self-managed housing is widespread, households self-construct their homes less often than they did earlier and contract out more work to construction workers. In 1972 social housing production (i.e. subsidized low-cost housing for owners-occupiers and not for renters) started growing significantly with the introduction of support from the federal government and special funds. This made home ownership possible for many people with permanent employment. Policies for urban land development were created with reservas territoriales (public land reserves) which included access to ejido land (land collectively used by farmers). In the early 1960s, many poor townspeople and rural-urban migrants began making their homes in self-built areas located adjacent to cities. Modest houses were built there by poor households. These non-regulated urban developments, which sometimes turned into slums, at the fringes of cities, caused many environmental problems. Regulation of land-use and provision of services were promoted sporadically by some politicians and later by government programs. In due course, many neighborhoods were consolidated, a process coupled with the gradual introduction of public services and the promotion of security of tenure. In the consolidated neighborhoods, citizens replaced initial building materials with more durable ones. Later on, they often built extensions, added storeys, and used internal spaces adjacent to streets as (work)shops. Self-managed housing is a more developed form of self-help housing. In 2003, of a total of 24.13 million housing units, 62.9 percent were houses produced through self-help; 23.6 percent, were social houses financed by housing institutions (between 1963 and 2003) and 13.5 percent were realized by private initiatives. 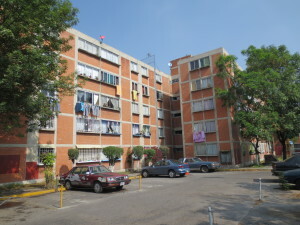 Social housing policy in Mexico has been developing for four decades and currently it is intended to benefit low-income families. One can still find a huge amount of individual self-help housing. In addition, well organized one family houses and in the cities, 3 to 5 storey housing complexes were realized. In a number of cases, one can find small houses in organized projects with the possibility of incremental finishing. In Mexico, housing practices underwent several paradigm shifts: from rental housing to home ownership, from irregular urban developments to more regulated expansion plans, and from massive standard housing to a broad offer of (mixed) housing. 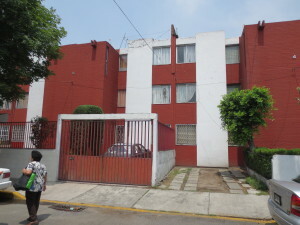 Meanwhile, the housing sector in Mexico has become complex with many public and private actors working to execute a variety of housing programs. The housing typology of Tlalnepantla de Baz, north of Mexico City (see Figure 1 in the presentation above of Nezahualcóyotl) include both self-developed as social (publicly financed) housing. 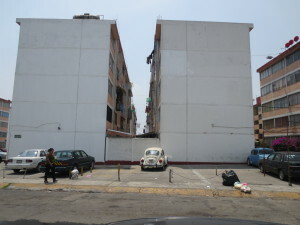 The housing situation in Tlalnepantla differs not fundamentally from the situation in other parts of Mexico City. 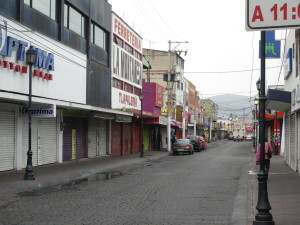 The municipality of Tlalnepantla has a population of about 650,000, while 173,340 homes are available. One must consider that the average dwelling size is limited and the average housing quality is relatively low. Many properties are from 40-50 m2. 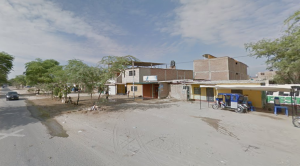 The municipality of Tlalnepantla has estimated that 65 percent of the houses (112,000 units) is in one way or another in a constructive way in a bad condition. 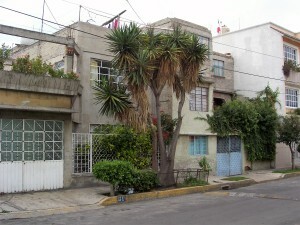 These homes can be found in the many fraccionamientos, often still non-regulated neighborhoods that are built by self-management. 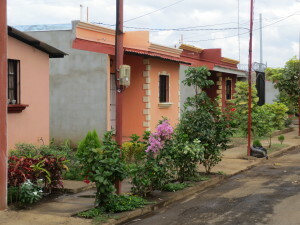 Self-built homes in a better condition can be found in consolidated residential areas, the so-called colonias. In addition, there are residential areas to be classified as residenciales: good quality single family homes. Increasingly, homes are being built in multi-storey buildings, with and without subsidies. The construction of multi-storey housing is needed to reach a higher density that often is required due to the high land costs and the land being ‘available’ for housing. 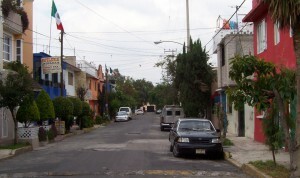 1 In many suburban zones in Tlalnepantla the housing function is prevailing. These areas already exist 40 years or more and are developed as self-managed housing areas. Urban planning was available most of the time. The central zone of San Javier was mainly an area with retail activities and workplaces, combined with housing for owners and workers. Due to the concentration of commercial activities, the residential function is repressed to the margin. 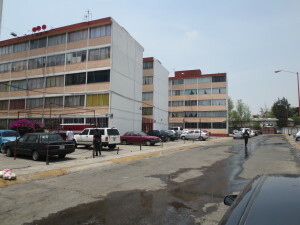 In Tlalnepantla Centre –an area west of the Plaza Gustavo Baz, the central square, one can find some multi-storey residential complexes, that were established with public involvement and others that were developed privately. ‘Tabla Honda’ is a huge housing area (built in the 1970s) in an urban park. Houses are multi-storey apartments in 4-5 layers. Living space is between 40 and 50 m2. 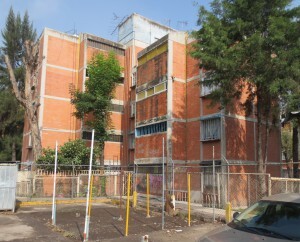 5 Housing complex ‘El Cortijo’, adjacent to the city center in the South. This urban housing complex exists of single family houses, and apartments in 3 and 5 layers. Average living space is between 40 and 70 m2. One can find 3-4 different housing types. Here one can find a huge housing area in 5 layers, built in the 1970s. The living space of the houses is approximately 50 m2. One can find here only one housing type. 8 Land development for housing in Egypt and Sadat City. The new town development in Egypt resulted in the planning of a series of new self-sustaining cities and satellite towns around Cairo. The best known of these is Sadat City being built in the desert at a distance of 65 km from Cairo, on the road to Alexandria. Egypt’s urbanization strategy is aimed at the regulation of the vast and rapid urban growth of Cairo in desert-like areas, which were never developed as agricultural land. During the 1980s and 1990s, the first generation of new towns was developed with the vision that housing through self-help was a significant investment trigger to accelerate the building of the new towns. However, it did not meet sufficiently the needs of the urban poor, caused by a number of reasons. 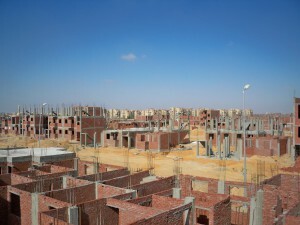 The target of Egypt’s National Housing Project (NHP) of 2005 was to provide 500,000 housing units within six years. Half of these units were located in old cities and the other half the new towns. The Project introduced the concept of ‘Build Your House’ (‘Ibni Beitak’) through a self-build method. The Project, allocated in 50 sites and distributed across 13 new towns, offered 89,000 plots of land to households, each measuring 150m2. Moreover, a financial grant of US$2,830 with a zero interest rate was paid to the candidate over 20 years and on an incremental basis according to the progress of the ground floor construction. The aim was to create a core housing development which would encourage other people to settle on the site. Eventually, the NHP turned out to be problematic for families with low or irregular incomes. In the initial years, moving to the distant suburb of Sadat City and finding work there, was impossible for many low-income families. In the beginning, there were insufficient services and infrastructures, and the obtaining of finance was hardly possible for them. This project relied on a cost recovery basis in order to meet the costs of construction as well as land prices in a (too) short period of time. It is said that: “the government policy created dwellings without dwellers in remote areas and dwellers without dwellings in urban areas.” (according to Soliman, see below). This caused housing informality on agricultural lands in the vicinity of existing cities, with the cooperation of various actors using communal self-help housing for meeting the urgent housing needs of the urban poor. 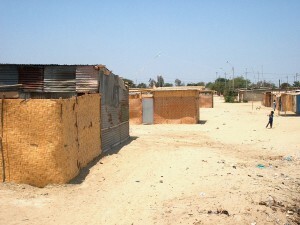 The shortage of affordable housing for the urban poor was one of the main causes of the revolt when Egyptians rose up in January 2011 to achieve the noble objectives of ‘bread, freedom, dignity, and social justice.’ Governments after the revolt introduced a new National Social Housing Programme (NSHP) to build one million housing units within a five years plan. The new NSHP is based on two principles; first: allocating plots of land of 300-400 m2 in the new towns to sell to private developers, and second: continuing the ‘Ibni Beitak’ approach in the new towns. But it seems to be difficult that the government is able to increase significantly the social housing production. Each 400 m2 plot will contain 16 housing units with an average height of four floors and four units per floor, which are to be realized mainly by developers and construction companies. This serves a certain middle-income housing segment. 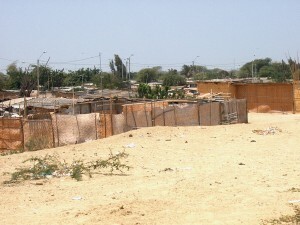 Under current political and socioeconomic transitions, it is hardly possible for the urban poor in Egypt to obtain assistance from the government concerning affordable housing – for example by the provision of a plot in a ‘sites and services scheme’, or by a housing finance program, assistance for self-help techniques and urban development. The mixed economy by which urban informality flourishes in converted agricultural areas is a reality in the fringes of the cities, which is a great loss for the national economy and the food production. The same methods should be employed on desert land by involving private developers to replicate what has been proceeded on agricultural lands. The government should continue to allocate large zones of desert land in the new towns for housing families with low-incomes. However, it should be facilitated with social amenities and low cost public transport to serve as an appropriate economic base with special incentives to encourage private developers to invest in and develop these areas in a sustainable way. See: Ahmen M. Soliman (2014) “Pathways towards self-help housing innovations in Egypt”, in “Affordable Housing in the Urban Global South, Seeking Sustainable Solutions”, Edited by Bredenoord, van Lindert, and Smets.